Attached HERE is a letter from City Planning–including information on their proposal to address excessive mechanical voids in Residential Buildings. This has been a long time in the making and it appears as though relief is in sight. 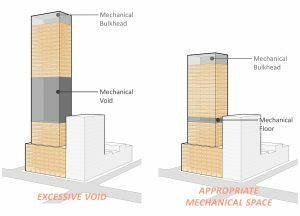 Developers will still be allowed as much mechanical space as they deem necessary on the roof and below grade, but be limited to 25′ of vertical rise without it counting against their FAR calculations. CRAINS NEW YORK has more information on this measure in today’s article by Joe Anuta. The text amendment linked HERE is expected to be certified on Monday, January 28, 2019. For a map of the affected areas and a press explanation, click HERE.